End of the Summer Annual ‘Honeyversary Tour’ finds us cruising across the state of Oregon to find friends, hot springs, rocks and much play. After Steve completed the paint job, new tires, new rear bumper/step, Fatty bike mount, and surf boards on the rack up top, the bus was eager for some serious adventure. Here we are just outside Bend on a beautiful, sunny day stocked up and rollin’ deep. We didn’t know in our enthusiasm for the moment that we were embarking on a 1350 mile journey filling our eyes with incredible views while emptying the gas tank. Our familiar trajectory across the state down hwy 20 is filled with wide vistas of painted hills, plateaus and other geologic vestiges of its volcanic past. From as far west in the state you can go to almost as far south-east that you can go in the state took us about 9 hours to do in one day. 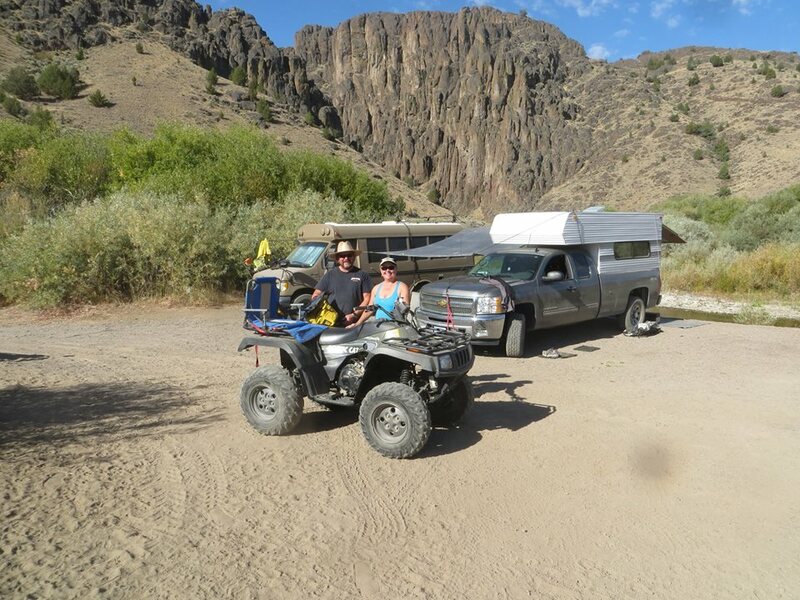 The help of some strong test coffee kept the wheels spinning after dark on the 33 miles of rough washboard off the paved road to bring us to the rim of the Owyhee River Canyon at Three Forks of the Owyhee. Stay the night on the Rim, morning coffee, then down we go! In the picture above, Steve and Lily are posed on the rim of the canyon before a 3 mile drop to the floor. The path of many switchbacks was actually the wagon road for the settlers to a fort down below. Above their heads, you can see the convergence of the North Fork and main Owyhee River coming together. On that very beach we camped and met Lisa and Mike for our stay. Lily was tuckered out from all the running and water-play of the first day so enjoyed the warm sunset with a nap. The board Lily was resting by is hauled into action up the river. The gravel bars were riddled with agates and thunder eggs while the river was jumping with fish. The dips were refreshing as it was into the 80’s during the day and we cooled off plenty with 30’s at night. 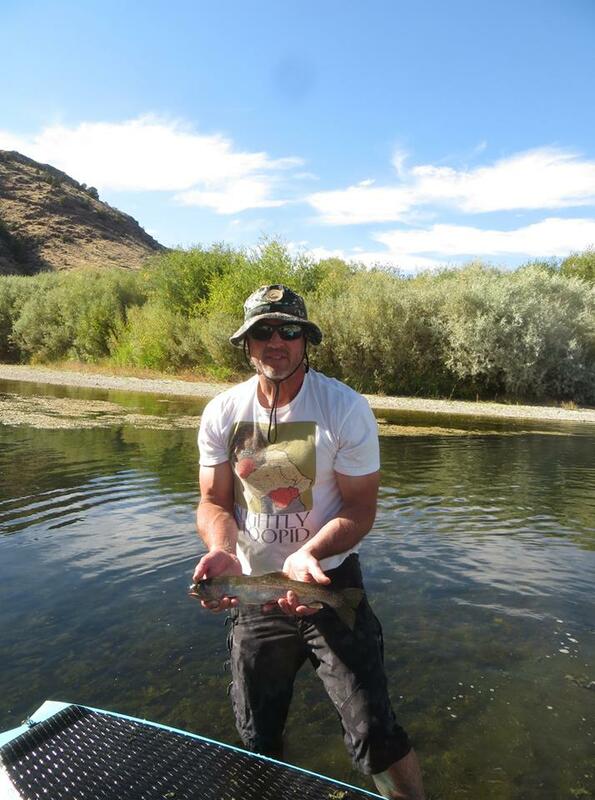 The trout were game in a sweet hole just up river. Tasty! The Fields and their trusty 4 wheel steed in front of base camp or should I say ‘glamp’. Great meals, great wine, rides to the hot springs, floats with dogs, and even laundry service! Behind us stands the ruins of a low range holding paddock and barn for cattle. 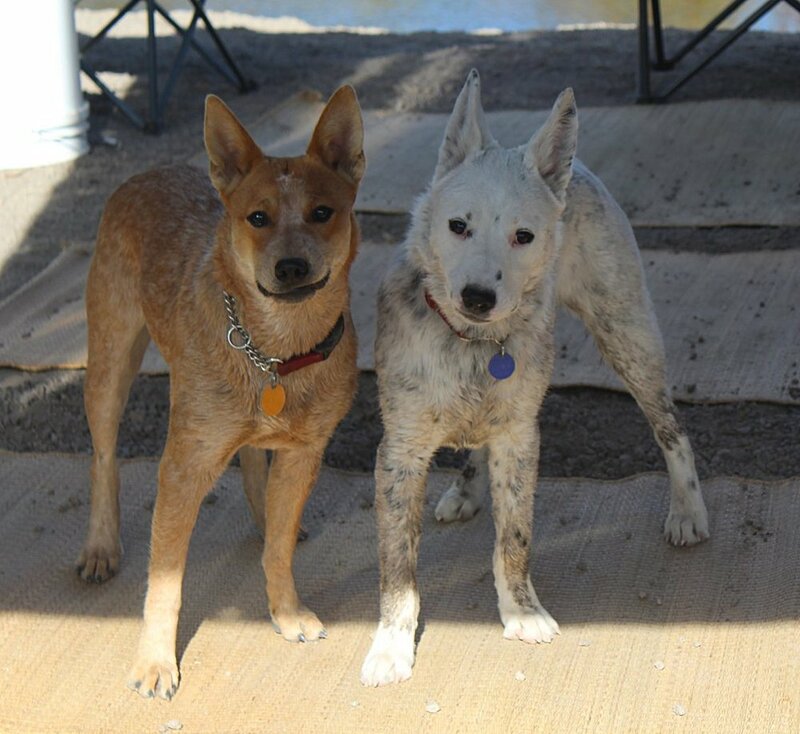 Okay, lets give these dogs something to do and go for a soak in the hotsprings! I’m sure they didn’t care but the humans sure did love the 6 mile round trip. Well worth it. Below is the ‘Warm Springs’, the Owyhee River courses along below the springs and the wagon road traces up the hill on the other side bolstered by the original piled rocks. The pioneers must have wept when they got to this oasis, I know I practically did. Lily looks like she’s posing for her Disney Movie ‘Lily, The Lovable Australian Cougar Dog’ . After 4 sunburn and chapped lip filled days, it’s time to bid the Three Forks of the Owyhee goodbye for now and find some hydration. Lisa snapped this shot of our brave stallion climbing out of the canyon. If you’d like to see where we went next, click the SIGN.